(410) 268-7191 to work with your Annapolis hydrojetting experts. Click here to view our current specials and discounts. Are your drains constantly clogged or slow to drain? There is likely a blockage in your sewer line that is crippling the function of your drains. Eliminate the clog with help from your local Annapolis hydrojetting specialists at Heidler, Inc.
Hydrojetting is the process of blasting water through your sewer line to clear away all debris and items blocking the pipes. It is an effective alternative to regular drain cleaning methods and can be used to clear away even the toughest clogs. Give us a call today to find out if hydrojetting is right for you. See what your neighbors think of our services and click here to visit our reviews and testimonials page. Why is hydrojetting so effective? Hydrojetting is successful at dislodging the most stubborn materials that have stuck to the walls of your pipeline, resulting in severe clogging problems. The process involves blasting water at high pressures to force all obstructions out of the pipeline. This frees your sewer and drain lines and ensures normal flow once again. Our hydrojetting solution helps your pipes remain clog-free for a longer period of time. Hydrojetting is especially effective when a blockage in the sewer line is causing wastewater to back up through the drains. This process forces the clog out of the pipe and returns the wastewater back where it can be properly vented or filtered. This service can also be used in combination with root saws, grease-cutting agents, or root-killing chemicals to help remove the worst clogs. We only use materials that are proven to be safe on your pipes and the environment. What kinds of drain or sewer line problems will hydrojetting solve? 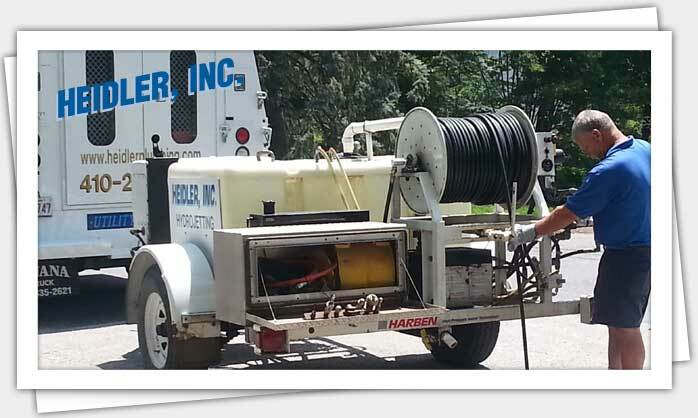 Our hydrojetting service ensures that your drain or sewer line is running as efficiently as possible. This process removes solid debris and unwanted particles that have built up over time. It can also get rid of debris that has attached itself to the walls of your pipe. Another substance that hydrojetting easily removes is grease. When grease enters your drains, it cools and becomes a solid; regularly pouring grease down the sink can lead to buildup over time. As a result, we do not recommend rinsing grease down the sink because it is likely to harden in the pipes and block them. If this has already occurred, you can count on us to eliminate the blockage and return your plumbing system to normal. Think hydrojetting is the solution for you? Your sewer line or plumbing system may require hydrojetting when enough debris has stuck to your pipes, impeding normal water flow. If tree roots have invaded your sewer line, hydrojetting may also be necessary to blast away the stubborn roots that have grown inside your pipeline. For more information on how hydrojetting services can help your drain or sewer problem, call us at (410) 268-7191 to schedule a home visit with one of our experienced technicians.